Cardiac catheterization is a procedure used to check for many cardiovascular conditions, especially blockages in the arteries to your heart that could cause a heart attack. During cardiac catheterization, a long thin tube called a catheter is inserted in an artery or vein in your groin, neck or arm and threaded through your blood vessels to your heart. Using this catheter, doctors can then do diagnostic tests as part of a cardiac catheterization. Some heart disease treatments, such as coronary angioplasty, also are done using cardiac catheterization. Angioplasty with or without stent placement : - Angioplasty involves temporarily inserting and expanding a tiny balloon at the site of your blockage to help widen a narrowed artery. Angioplasty is usually combined with implantation of a small metal coil called a stent in the clogged artery to help prop it open and decrease the chance of it narrowing again (restenosis). Closure of holes in the heart : - Some congenital heart defects involving holes in the heart can be treated by threading a catheter to the hole to close it, rather than having open-heart surgery. Balloon valvuloplasty : - This procedure can open narrowed heart valves by threading a catheter with a balloon-like device to the part of your heart valve that's narrowed and inflating it. Cardiac catheterization is usually performed in the hospital. The test requires some preparations. Don't eat or drink anything for eight to 12 hours before your test. Having food or drink in your stomach can make your test results inaccurate. Cardiac catheterization tests are often scheduled for the morning, so you can have something to eat and drink soon after your test. Try to relax. It's common for people who are having a cardiac catheterization to feel anxious or nervous. It's possible that the test will reveal that you need surgery right away, or that you could have a side effect from the medication. Although the potential results can be unnerving, try to relax. Being nervous may cause your heart to beat more quickly or irregularly, giving your doctor inaccurate test results. If you are feeling anxious, talk to your doctor about these feelings before the procedure. Once you're admitted to the hospital, you'll have your blood pressure, pulse and body temperature checked. You'll be asked to use the toilet to empty your bladder. You'll be asked to remove dentures and may need to remove jewelry, especially necklaces that could interfere with pictures of your heart. You'll wait in a pre-operating room until it's time for your procedure - you can often have someone wait there with you. Cardiac catheterization is often done in a special operating room called a catheterization lab. The catheterization lab has special X-ray and imaging machines that normal operating rooms don't have. Cardiac catheterization is usually performed while you're awake, but sedated. An intravenous (IV) line will be inserted in your hand or arm, and will be used to give you any additional medications you might need during your procedure. You may also have monitors (electrodes) placed on your chest to check your heartbeat during the test. Coronary angiogram : - If you're having this test to check for blockages in the arteries leading to your heart, a dye will be injected through the catheter, and X-ray images of your heart arteries will be taken. In a coronary angiogram, the catheter is usually placed in the artery in your groin or wrist. Right heart catheterization : - This procedure checks the pressure and blood flow in the right side of your heart. 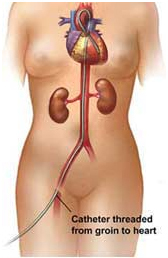 For this procedure, the catheter is inserted in the artery in your neck or groin. The catheter has special sensors in it to measure the pressure and blood flow in your heart. Heart biopsy : - If your doctor is taking a sample of heart tissue (biopsy), the catheter will usually be placed in the artery in your neck. A catheter with a small, jaw-like tip is used to cut a small sample of tissue from your heart. You may feel pressure as this catheter is being used, but you likely won't feel the actual tissue being snipped. Balloon angioplasty, with or without stenting : - This procedure is used to open a narrowed artery in or near your heart. The catheter will likely be inserted in the artery in your groin for this procedure. A long, flexible catheter will be thread through your arteries to the narrowed artery. Then, a smaller balloon catheter will be led through the flexible catheter and inflated at the narrowed area to open it. In many cases, your doctor will also place a mesh coil called a stent at the narrowed portion to help keep the artery open. Closure of heart defects : - If your doctor is closing a hole in your heart, such as an atrial septal defect or patent foramen ovale, you will often have catheters inserted in both the arteries and veins of the groin and neck. A device is then inserted into your heart to close the hole. Balloon valvuloplasty : - This procedure is done to open up narrowed heart valves. The placement of your catheters will depend on which valve problem you have. A catheter is threaded across the valve. A balloon is then blown up to make the valve open more easily. You may feel pressure as the catheters are inserted into your body, but you should not feel discomfort from the balloon treatment itself. Although you may be sedated, you'll be awake during the procedure so that you can follow instructions. Throughout the procedure you may be asked to take deep breaths, hold your breath, cough or place your arms in various positions. Your table may be tilted at times. Threading the catheter shouldn't be painful, and you won't feel it moving through your body. Tell your health care team if you do experience any discomfort. It usually takes several hours to recover from a cardiac catheterization. After your procedure is finished, you'll be taken on a gurney to a recovery room while the anesthesia wears off. This usually takes about an hour. After you leave the recovery room, you'll go to a regular hospital room. The plastic sheath inserted in your groin, neck or arm will be removed soon after unless you've had a blood-thinning medication during your procedure. It's very important not to move the limb that your catheter's been inserted in, or to lift your head if your catheter is in your neck, so as not to cause serious bleeding. After your catheter has been removed, the technician or nurse who has removed your sheath will apply pressure to the insertion sites, and you'll need to lie flat for one to six hours after the procedure to avoid serious bleeding and to allow the artery to heal. You'll be able to eat and drink after the procedure. The length of your stay in the hospital will depend on your condition. You may be able to go home the same day as your catheterization, or you may need to stay overnight or longer. Longer stays are common if you have a more serious procedure immediately after your catheterization, such as angioplasty. If you're having cardiac catheterization as a test, your doctor should explain the results to you. Your results may show that you need surgery or another treatment to correct a heart problem. If you've had a coronary angiogram, your results could indicate that you need angioplasty or a stent, or a more major open-heart surgery called coronary bypass surgery. In some cases, your angiogram may show that angioplasty would likely be an effective treatment to open a narrowed artery. If your doctor finds this, he or she may perform angioplasty with or without a stent placement right away so that you won't need to have another cardiac catheterization. Your doctor should discuss whether this is a possibility before the procedure begins.